Using an Atmega 328P chip without arduino board and with standalone power supply is a powerful, cheap, functional and low consumption solution. This procedure explains how to design and develop a low consumption music player based upon an arduino clone. Atmega 328P, 8Mhz Resonator, 10kOhm Resistor, DC/DC Step-up Converter with USB 5 Volt output, 3D printed Flexing battery case (1 or 2 battery slots) and/or Battery pack (e.g. 1/2 AA 1.2V or 1 Li-ion 3.7V), 8 Ohm speaker, Button switch, Wiring, Soldering. Enjoy and figure out how to add new melodies. You are encouraged to share under comments below your musical successes! 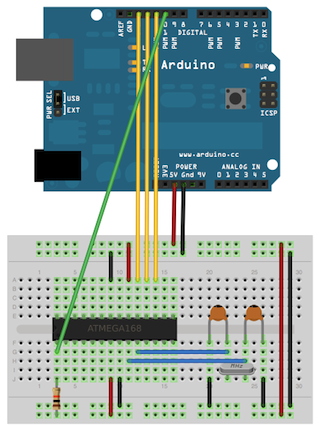 An Atmega 328P without arduino board can achieve the same capabilities of the arduino board, using the same arduino IDE programming and coding environment. Using an Atmega 328P chip without arduino board is powerful, cheap and functional. For a fully standalone setup, this requires a dedicated power supply. 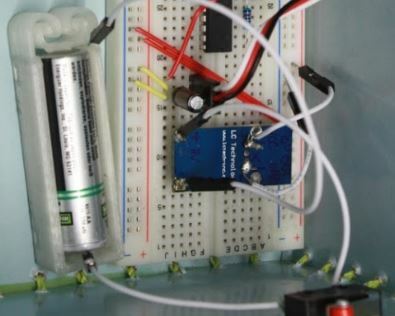 This procedure explains how to design and develop a power supply for an arduino clone. DC/DC Step-up Converter with USB 5 Volt output, 3D printed Flexing battery case (1 or 2 battery slots), 1 or 2 AA batteries, Wiring, Soldering. Wire and solder the battery power and ground pins on the DC/DC Step-up Converter with USB 5 Volt output (Hardware resources, link 1) (Image 1). An Atmega 328P without arduino board can achieve the same capabilities of the arduino board, using the same arduino IDE programming and coding environment. Using an Atmega 328P chip without arduino board is powerful, cheap and functional. 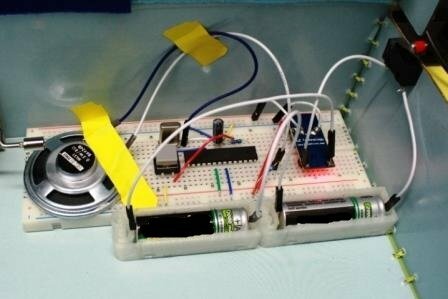 This procedure explains how to design and develop a simple, small sized and fully functional arduino clone. Arduino UNO, Atmega 328P, 10kOhm resistor, 16Mhz resonator. Write and upload any program with the Arduino IDE upload command. USB connection is an important feature to ensure the rumba taurino board remains operative. Unfortunately, problems can frequently arise. 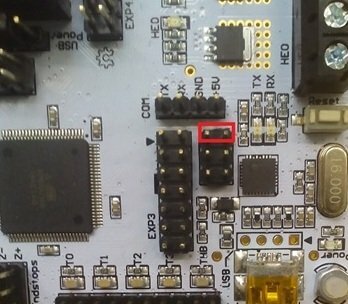 This procedure aims to explain how to solve USB connection issues between computer and Rumba Taurino board. Rumba taurino board, USB cable, Two-pins bridge. Switch on the computer (defined PC below). 3D printer or similar (defined device below) must be off. Under PC Device Manager (link: Start> Run> Driver) check if there are RUMBA TAURINO BOARD devices installed but not recognized (unknown). If there are unknown devices, remove them. With device off, identify the two pins highlighted in red (see Images sections). Short the two pins to switch to DFU mode (Device Firmware Update). More details on DFU mode can be found at the link provided under credits (link 3). Connect the USB cable to the PC and then to the device. Wait for 10 seconds and then remove the short on the two pins (avoid making short-circuit with other pins). The LED of the serial communication (TX and RX) start blinking. PC detects new hardware and tries to install the driver. This automatic task should give a system error and fail to install any driver. Download the DFU programmer and the drivers for the USB connection of the Rumba Taurino board that can be found at the link provided under credits (link 1). Save it on PC and unzip it. This is the path of the driver and DFU programmer required in step 9 and 10. Open the tool for manual installation of drivers (link: Start> Run> hdwwiz). Select the option install from list, select show all devices, disk driver and insert the path where the drivers for the USB connection of the Rumba Taurino board are saved on the PC. From the list select ATmega16U2 to install the driver for the USB connection of the Rumba Taurino board. Run the DFU programmer to flash the USB port. If a message on memory error check appears, click a keyboard button to flash the port. If needed and if not already available on the PC, install the driver for Rumba Taurino board (not the USB driver installed in step 9! ), that can be downloaded at the link provided under credits (link 2). Switch off the device and switch on again to verify that it is now recognized by the PC and a USB port is assigned. Under devices the Rumba Taurino board icon appears. 05/OCT/2016 – Project structure improved with sections: Introduction and scope, Materials and Equipment, Procedure, Hardware resources, Software resources, Credits and Disclaimer. This article launches a series of open source hardware and software projects that will be shared in the next future. 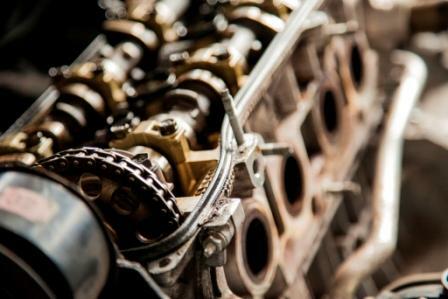 According to opensource.com, open hardware or open source hardware refers to the design specifications of a physical object which are licensed in such a way that said object can be studied, modified, created, and distributed by anyone. Open hardware is a set of design principles and legal practices, not a specific type of object. The term can therefore refer to any number of objects—like automobiles, chairs, computers, robots, or even houses. Like open source software, the source code for open hardware (schematics, blueprints, logic designs, CAD drawings, etc) is available for modification or enhancement by anyone under permissive licenses. Users with access to the tools that can read and manipulate these source files can update and improve the code that underlies the physical device. They can add features or fix bugs in the software. The license governing the reproduction of open hardware must allow modification and distribution of those design files in a way that allows others to easily obtain them. This makes possible and even encourages studying, troubleshooting, modifying, and improving open hardware.